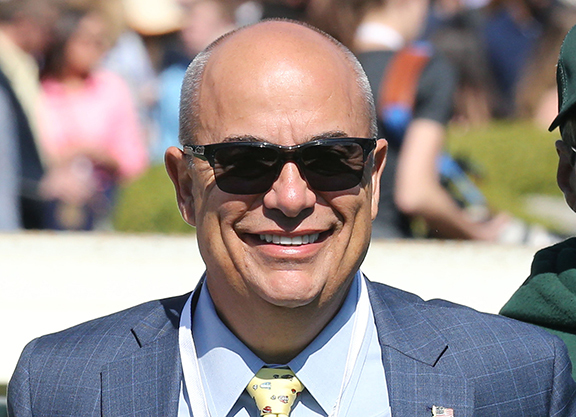 With the OBS March 2-Year-Olds in Training Sale right around the corner, TDN’s Senior Editor Steve Sherack caught up with leading trainer Mark Casse for a Q&A session. Casse has enjoyed no shortage of success shopping for his clients out of the 2-year-old sales in Ocala in recent years, led by champion female sprinter and last term’s GI Breeders’ Cup Filly & Mare Sprint heroine Shamrock Rose (First Dude) ($120,000 2yo ’17 OBSAPR). Casse’s highlight reel also includes: GISW and Canadian champion 2-year-old filly Spring in the Air (Spring At Last) ($130,000 2yo ’12 OBSMAR); Canadian champion 2-year-old filly, MGSW and GI Kentucky Oaks runner-up Wonder Gadot (Medaglia d’Oro) ($325,000 2yo ’17 OBSAPR); Canadian champion 2-year-old filly, GSW and GI Breeders’ Cup Juvenile Fillies third-place finisher Delightful Mary (Limehouse) ($500,000 2yo ’10 OBSAPR); and MGSW and narrow GI Breeders’ Cup Juvenile Turf runner-up Airoforce (Colonel John) ($350,000 2yo ’15 OBSAPR). Inducted into the Canadian Hall of Fame in 2016, Casse was one of nine finalists on the ballot for induction into the National Museum of Racing and Hall of Fame earlier this year. He is also on the OBS Board of Directors. Q: Take us through your process while shopping the 2-year-old sales. What is your approach and what do you look for when scouting talent? MC: For me, I narrow it down drastically by pedigrees, first and foremost. Unless I have a specific client that just wants some quick horse, we’re normally looking for horses that we feel are going to be Classic types, whether it’s colts or fillies. So that narrows things down greatly. I don’t want to be drawn in necessarily by just the looks of a horse. I feel like we have 100 or more years of history and you’re silly not to use it. You look at a guy who weighs 250 pounds and you look at another guy who weighs 125 pounds and you ask, ‘Which one has high cholesterol?’ It may have nothing to do with how big they are or how much they weigh. It has to do with family history. And I play those same factors when buying horses. My brother Justin has become a big part of the buying process now. He goes and does the heavy lifting for the most part, then I’ll come in a little later because we’re busy with our horses. It’s nice because before I used to have to do it all. It’s gotten now where he does a big part of it and then we kind of team up. It’s made my life easier and I think it’s made our buying better, too. Q: You have your own training base nearby, the Casse Training Center in Ocala. Can you talk about the initial training process for your 2-year-old buys? Do they all immediately get time off out of the sale or is it more of a case-by-case basis? MC: It’s case by case, and I think if you start making just a set procedure, you’re doing the wrong thing. A lot of people think as soon as the 2-year-old sales are over, ‘Oh, I’ve got to give them time or this or that.’ I don’t agree. I think you go with each individual. When you’re buying, you have to look at what your goals and expectations are and what you want to achieve. Obviously, if we go buy some quick horse and we think his future is as a 2-year-old, we’re going to be less likely to give that horse the time that we would another. In everything I do– whether training, buying, etc.–I try to have an open mind. Q: I asked Dennis O’Neill this same question a few years back. Are there certain defects/flaws or perceived negatives that you can live with at the 2-year-old sales that other buyers may pass on? MC: My rule is as long as you say ‘a little bit’ about anything, it doesn’t seem to bother me. Couple things… Back to the pedigree. The more pedigree and the more that the family has shown their ability to continue to race–they have lots of siblings or a mare that made many starts–I demand less conformation from them. A lot of times, I will buy a 2-year-old that I would never buy as a yearling simply because they have some conformation faults. But if they show they are able to handle those faults and we’re not seeing any issues with it radiographically or otherwise, then I’ll buy them. Q: Champion Shamrock Rose was certainly a nice find for $120,000 at the 2017 OBS April Sale. She worked in a bullet :10. Can you reflect on her as an OBS 2-year-old? MC: She’s beautiful. She’s just everything. The one thing she lacked, maybe a little bit, was that she didn’t have the star pedigree. But First Dude is a very nice sire in his own right. To me, she just looked like a racehorse. She fit nicely. Her pedigree wouldn’t have worked for some of my other clients–I’ve just had tremendous luck with the Conrads. They had given me a budget and I actually went over it just a little bit. I felt like for the money, you know, it sounds crazy, but when you’re buying a horse for $120,000, you have to give and take. You’re not going dot all the I’s and cross all T’s. But I thought we were getting an outstanding individual when we purchased her. Q: Switching gears to another one of your current stable stars and Triple Crown hopeful War of Will (War Front). He was selected by your brother Justin on behalf of Gary Barber for €250,000 out of last year’s Arqana May 2-Year-Old Breeze Up Sale. Have you had much experience with overseas 2-year-old purchases? Any thoughts or comparisons on how he was prepared and arrived to you versus the 2-year-olds that you’ve bought here in the States? MC: To the best of my knowledge, I think I’ve only had two that I could think of–him and one other. He’s been perfect since the beginning. I don’t know whether it was a process of his early upbringing or that’s just who he is. He’s just that kind of horse. So, to answer that question, I don’t think I have enough data to give you a true answer. Q: OBS March is the first 2-year-old sale on the calendar this year. How do you see the juvenile market playing out? MC: I think horse racing is well. There seems to be more money out there than I’ve ever seen before. I think the sales will be good. We’re probably going to be selective, but we do have a few people who will buying. We have an extremely strong and well-diversified 2-year-old crop. We did a lot of stuff as yearlings, which I like to do because I can have them from the beginning at our training center. Q: Freshman sires are well-represented in the OBS March catalogue, with Triple Crown winner American Pharoah at the forefront. Are there any that are sticking out to you? MC: I have an American Pharoah filly that I think could be any kind. She is definitely at the head of the class right now. I have a few American Pharoahs, in fact, and I’ve been impressed with them so far. The horse that has kind of surprised me, honestly, and I like what I’m seeing out of them, are the Tonalists. I have a couple of Competitive Edges that can run, too. Q: It seems like every year the 2-year-old sales get increasingly popular as more graduates show up in the Classics and you see regular yearling buyers like Tom McGreevy, Bruce Hill of Live Oak, etc., begin to participate more. You’ve certainly supported this market for quite some time now. Can you discuss this trend and the growth of the 2-year-old market? MC: I think for a while a lot of the big names steered away from them, but now they’re coming. 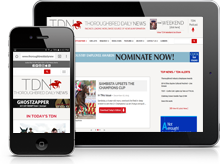 There’s been so much success from the 2-year-old sales that it’s become intriguing to many. There’s still a few people that don’t do them–there’s pros and cons to everything. I’m going to be a little bit on the selfish side here, but I think when Mr. Oxley got pretty involved in it eight or nine years ago now, with his high profile, integrity and knowledge of the game, I don’t think that hurt. Q: What are your thoughts on the synthetic OBS Safetrack surface? How does it influence your evaluation process? MC: I’ll go down swinging for probably the rest of my life saying, ‘I wish every track was synthetic.’ I just think it’s so much easier on them than dirt. A funny thing the other day, we were having a board meeting and it was pouring rain and somebody said, ‘Well, I don’t know how much training will be going on tomorrow at all the tracks, but we’ll be training at OBS.’ And that’s because it takes the rain so well. In all honestly, does it make it more difficult as a buyer? Absolutely. Because horses move over it easier and there’s not as much separation. But for the most part, after they’ve went through their drill and you get them back home after you bought them, they’re a little healthier. Q: The OBS March Sale was expanded and opened up in 2015. There are 577 juveniles catalogued for this year’s sale. What do you think of the catalogue assembled? MC: It looks like a good catalogue. It’s amazing to me how things have changed. The March Sale was always the big money sale and the high prices, but it’s all went now where March will be big, but April will be bigger. I guess maybe part of it is because horses are getting a little more time to develop. Q: The OBS complex has undergone massive renovations the past few years. How does it look and is the project almost complete? MC: It’s pretty close, it looks great. We’re very proud of it. We replaced almost the entire building. The auditorium is all up to date-It’s an entirely new place. It needed to be done. It’s been long, it’s been expensive, but in the end, it will be worth it.